The iconic British phone box goes literary | Notes from the U.K.
BT (that’s British Telecom—a.k.a. the phone company) has been uninstalling the iconic red British telephone boxes all around the country in recent years. Now, I understand that pay phones aren’t a money-making proposition anymore, but where cell phone coverage is spotty (and around here it has a bad case of the measles) they can be a lifeline. Besides, people like them. They’re iconic. They’re red. They’re shaped like Dr. Who’s police box. In places, villages have fought to keep them, and as far as I know they’ve lost the battle, no matter how good their arguments. My village lost two—one by the beach, which could potentially have saved a life because it was in a measles spot, and another along the road, which was less important, although could have presented a better argument for keeping that one if somebody hadn’t set it on fire. In a few places, though, villages lost the phones but kept the boxes and turned them into tiny red libraries, where people take books, leave books, and, judging by the number of images online, take pictures. Relevant photo for a change: a phone box library at Wall, Staffordshire. Photo by Oosoom. No doubt. They’d cause an even worse injury if they exploded, but neither one is likely, and local residents launched a twitter campaign to save the library: #Saveourphoneboxlibrary. I haven’t a clue what this has to do with the usual intercultural mayhem I write about. I’ve seen neighborhood-maintained libraries in the U.S. They looked like oversize birdhouses, not phone boxes. But then, I don’t think the U.S. has any phone boxes left in the wild–they’re all in zoos now, where they fall into despair and refuse to breed. Maybe that says something about our cultural differences. I leave it to you to figure out what. 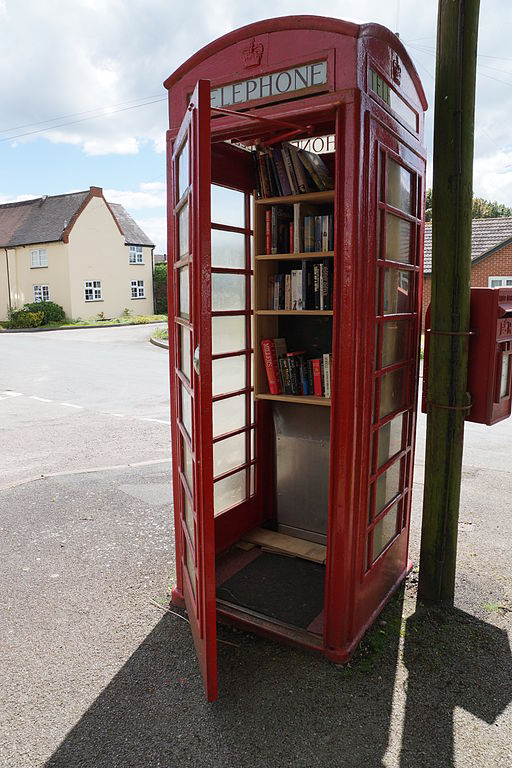 This entry was posted in Other Stuff and tagged anglophile, Britain, England, humor, libraries, red phone boxes, village life by Ellen Hawley. Bookmark the permalink. So much for the pay phones in old movies. Its all cell phones now. I sometimes feel sad that old things get thrown away or shoved rudely out of the way. But it is the way of the world, I guess and of course, change is inevitable. I felt the same way when the old fashioned American phone boxes disappeared. But the truth is, I didn’t care about them when they were there–only when they were gone. The way of the world indeed. Ellen, look at the youtube video of the Mojave Phone Booth. Google it. Very interesting! I did and found a bunch of videos. If you want to send people to one in particular, send me a link. Otherwise, folks, just google it and take potluck. The one I watched was interesting, if a bit bizarre. “They’d cause an even worse injury if they exploded” – thanks for my first LOL of the day! Excuse me, but I don’t think you’re taking the danger seriously enough. I recently finished Bill Bryson’s Notes From a Small Island. It was published over twenty years ago, but this is a recurring theme in the book even then – the old and the beautiful being torn down and replaced by the modern simply for the sake of modernising. And sure, maintaining the old buildings and red phone boxes are costly, but Great Britain has such a rich architectural heritage, one would assume the powers that be would think it worth preserving. During my brief stay in the UK the issue of the day was bendy-buses replacing the iconic Routemasters on the streets of London. Personally, I never did change clothes in the old phone boxes. Call me a prude if you like. I’ve been called worse. There are some protections for old buildings. People talk about something or other being Grade One Listed, or Grade Two Listed. I’ve heard that so often, I almost think I know what they mean. I don’t. Whatever it is, it doesn’t cover phone boxes, although it should. Buses, though? Oh, come on. That’s just Boris Johnson looking for an issue and finding a dumb one. What do they do with the boxes not repurposed as libraries? I would love to get one for my house. Of course that would involve shipping from UK. Oh well. One would look nice in the living room, wouldn’t it? But yeah, the postage…. I don’t know what they do with them. Chop them up in little pieces, I’d guess. Wouldn’t they just? Some people down the road were using a broken-down car that way. There is a Red Telephone box ”graveyard” in Kent not far from where I grew up. Google images for the phrase ‘red telephone box graveyard’. It’s literally the saddest non-living thing you’ll have seen since the last episode of Metal Mickey aired! Maybe we should organize a raid: Free the Red Telephone Boxes! remaining and “repurpose” them. I’d like one in my garden. Sometime I’ll bore you with the mayhem invested on our little library bird houses. Nice idea but it doesn’t take into account American adolescence and drug use which, separately or combined, seem to cause people to hate books and tear them up. Sigh. Same mentality that set the phone box here on fire–and that was before anyone got around to librarying it. We can’t even have a regular post box on our country road, because is on the way to a place where kids like to go drinking and doping and … whatever. Apparently they carry baseball bats with them, and anything within smacking reach after they’ve ingested a sufficiency of Interesting Substances is fair game. With the first few words, I was reminded of our friends’ village, where they can’t use the mailbox because snails crawl in and eat off the postage–at which point the post office refuses to have anything to do with them. (Them being the letters, not the snails, although the post office probably doesn’t involve itself heavily with the snails either.) But what you’re talking about sounds more threatening. Huh! Glue-sniffing snails! Definitely preferable to drunken teens. Definitely. The come out after dark but they don’t usually attack anything larger than themselves. Unless its dead. It’s really a shame, isn’t it? All in the name of “progress”. :( I sure hate them go. It was the same with the (old Bundespost) yellow telephone boxes in Germany. Immediately after the phone part of the Bundespost became German Telecom and they changed their colour to Magenta, they started getting rid of the yellow telephone boxes and replace them by Magenta open ones – much lkess visible, btw. And then, soon after that, they started to take them away completely. Sounds like someone in an office somewhere asked, How can we waste some money? and came up with that plan. Our American phone boxes were germ-infested and hardly worth holding onto. I’m sure they all were, no matter what country they were in, but these days that’s supposed to be good for our immune systems. Or something. That is sad that such a historic, iconic (as you say) emblem is disappearing from the landscape. I love the library idea and could see possibilities for other uses as well. It occurred to me that an ‘adopt’ program could work – as we do here with trails and garden spots ( both as likely to explode as books). It is a sad world, indeed, when bureaucracy rules over imagination, whimsey and a touch of belief that humans treasure their past as much as heavy-handed politically-correct what-if a shelf fell …. That’s a great way to reuse them and keep them around. It is. I’m sad we didn’t manage it in my village. We do have a book swap, but it’s hidden in the back room of the village store and isn’t anywhere near as charming. I actually just read about two American tiny library / community library boxes being told they had to cease and desist. I am not one to whinge about “health and safety gone mad” but these examples and the one you reference in Britain strike me as exceedingly petty. Although I have not made use of our local one, I think the whole give-a-book-take-a-book thing is a lovely community project and one sited in an iconic phone box seems even better. More generally, I have been sorry to see the demise of phone boxes over the last decade or so. It was justified by the growing ubiquity of mobile / cell phones, of course, but I think that may just have been a convenient excuse since they removed them from areas where there was zero mobile reception. Zilch. Having lived in a rural area of Scotland for over a decade, there were definitely places where the break down of the car would have been a complete pain in the rump as I would have had to have walked a considerable number of miles in order to make a call. I at least hope they ensure that the phone boxes get another lease of life when they quit being used for communication. I know of at least one being used as a wood store in someone’s garden. Another great use. See above, where Belladonna Took just suggested tiny greenhouses. I remember when New York (and probably other parts of the country) took the booths out and replaced them with metal–oh, I don’t know how to describe them. Things. Things that held a phone and gave you the illusion of privacy with metal wings around your head that did nothing to block out street noise. They did take up less space–I’ll give them that–but I did miss the booths. Oh yes. Those were terrible because you were surrounded by noise and had no privacy while you yelled into the phone in order to be heard above the noise. Tiny greenhouses is a fantastic idea. Right. Cell phones are such an improvement: You’re surrounded by noise and have no privacy while you yell into the phone–oh, wait, that was the open phone booth, wasn’t it? The red boxes are beautiful. I would contribute to that mini-library. I was surprised to find 2 standing phone booths inside the public library in New York City. The phones were removed, but the wooden seats remained. It was Christmas season and I’d been walking for hours looking for a warm place to sit. I took advantage. What a great use for them. I’ll never understand England. They get rid of the red telephone boxes, and yet keep the Queen. It’s hard to explain: The phone boxes are way cheaper. I’m not sure whether to hope your Little Free Library project goes well or badly, but whichever is best, I hope it goes that way. I say we make a worldwide petition to have the red phone boxes instated as historic patrimony, and therefore, they can’t be destroyed. Pingback: British parliamentary traditions | Notes from the U.K. I remember as a teenager in Liverpool, if there was more than one person waiting to use one ot the person inside had a huge pile of coins (indicating they were there for the duration) you’d just walk down to the next one. They always smelled bad and invariably had cracked or missing pains but they were great! I’d forgotten how bad phone booths (and I’m talking about the ones in the U.S. here) used to smell. Funny how nostalgia edited that out. We saw some working phone boxes in Suffolk over Christmas – also an area of poor reception for mobiles. I used to get excited by the library boxes – now I am more interested when I see one with a phone in it. Truly. There’s a box surviving in the next village down the coast, but I haven’t thought to look inside and see if the phone’s there. We don’t just have red ones. We have white ones in Hull and green ones in some National Parks. Really? And they feed into the same phone network? That’s amazing. Our village lost its last phone box. First the phone stopped working, then someone set it on fire. At that point, no one was inclined to fight for its survival. It’s been years since I used one, but I do miss them. Up to about 25 years ago I used them a lot, but after they gave me a mobile at work I rarely used one again. Though I miss them I’m also one of the reasons they are all out of use. Also meant to add that the white boxe are Hull’s own Telecom company. Green boxes are meant to be less obtrusive in areas of natural beauty.